Dana Schutz’s painting of Emmett Till in Whitney Biennial sparks protests calling for its removal and destruction. NY Times also covers the issue, as does The Fader, The Independent, Art Forum, and The Daily Beast. Two Coats of Paint looks at it from a censorship perspective. Christina Sharpe speaks on the controversy. Aruna D’Souza discusses the issue for CNN. The New Republic’s case against Dana Schutz. Protester Parker Bright meets with curators, who say painting will stay. J.J. Charlesworth questions whether an artist’s color should limit the subjects they can represent. Imposter sends fake Dana Schutz letter to various publications. Artnet collects the social media responses to the controversy. Brian Boucher interviews Dana Schutz regarding the controversy. RIP: Corrina Mehiel, who was found murdered at the age of 34. RIP: Gerukatte Gangaia, who collapsed and died on stage at the age of 63. RIP: Trisha Brown, who passed away at the age of 80. RIP: David Rockefeller, who passed way at the age of 101. RIP: Bernie Wrightson, who passed away at the age of 68. RIP: Jeff Morrison, who passed away at the age of 59. Karen Fiorito receives death threats over her anti-Trump billboard in Phoenix. Zehra Doğan sentenced to two years and ten months in prison for her painting of Kurdish town attack. Photos show extent of damage to Guercino painting stolen from an Italian church in 2014. Homeless man charged with vandalizing Thomas Gainsborough painting at National Gallery. Vilma Gold gallery will close. Ibid Gallery closes its London space. Nearly-naked masked man escorted out of Art Basel Hong Kong after causing a stir. Study finds that there’s still a gender gap in North American museum directorships. Władysław Kaźmierczak and Ewa Rybska might be forced to return to Poland from UK to settle a legal dispute. Why Centre Pompidou only broke even on hugely popular Koons retrospective. How Britain’s art scene is being strangled by Brexit chaos. Artnet thinks that anger over Trump presidency has been good for art supply stores. New global fund to protect cultural heritage in war zones, spearheaded by France and the UAE, raises $75mil. Centre Pompidou has plans to set up a branch in Shanghai’s West Bund cultural district. Howard Hodgkin’s last painting, a self-portrait, featured in National Portrait Gallery show. Daniel Weiss has a new plan for The Met to balance the budget and proceed with renovations. Artnet also covers the plan. Gemeentemuseum will launch major blockbuster exhibition of works by Piet Mondrian this summer. Artinfo writes about Robert Irwin’s untitled: dawn to dusk, 2016, at the Chinati Foundation. Michael Rakowitz and Heather Phillipson winners of the next Fourth Plinth commissions in Trafalgar Square. Highlights from Carmen Herrera’s retrospective at the Wexner Center. Takashi Murakami’s show at Garage Museum of Contemporary Art will have installation recreating his factory. “Basquiat Before Basquiat” at Museum of Contemporary Art Denver focuses on artist between ’79 and ’80. M+ Pavilion’s Ambiguously Yours: Gender in Hong Kong Popular Culture explores gender-bending golden age. Juliet Helmke reviews Marisa Merz at the Met Breuer. JW Anderson’s Disobedient Bodies comes to the Hepworth Wakefield. Rijksmuseum announces 2017 Rijksstudio award shortlist. Sophie Calle to haunt Green-Wood Cemetery for the next 25 Years for Creative Time’s latest major initiative. The known information so far about documenta 14. Venues for Athens leg revealed. Jonas Mekas to show photographs from his time as a WWII refugee at the exhibition. Cecilia Alemani gives a preview of the Italian Pavilion at this year’s Venice Biennale. Samson Young explains how 1980s charity pop singles inspired his exhibition at this year’s Hong Kong pavilion. 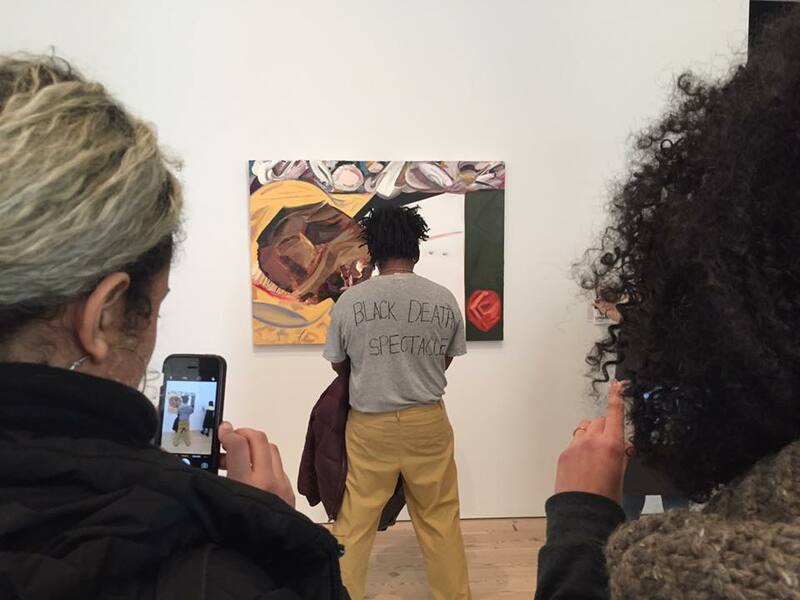 Flash Art reviews the Whitney Biennial. Cooper Union alumni in the 2017 Whitney Biennial. Nylon takes a look at Deana Lawson, Maya Stovall, and Cauleen Smith, who are all in the show. Mike Kelley Foundation for the Arts gives out $319k in grants. MOCA adds Amanda Hunt and Anna Katz to its staff. Christie’s to offer Cy Twombly’s Leda and the Swan from 1962 in its May Post-War sale. Warhol’s photos from trip to China to be auctioned by Phillips at the Mandarin Oriental in Hong Kong. Artcurial to offer rediscovered marble by Auguste Rodin during Paris May 30 Impressionist & Modern Art 1 sale. The Art Newspaper looks at Clare McAndrew’s Art Market 2017 report. A look at the ramifications of the presidential election for France’s art market. The Art Newspaper says that interest in Middle Eastern art is on the rise in China. Barron’s looks at the market in China. James Tarmy shows you the smart way to invest in art. Salon explores: The affordable-art paradox: Do reasonable prices make pieces of art less desirable? Art market in Hong Kong stays healthy despite turbulence in the Western art market. Artnet previews Art Basel Hong Kong 2017. Artinfo takes a look at the fair. Artsy’s choices for the best booths at the fair. Henri Neuendorf’s choices for the most impressive works at the ABHK. How dealers are now targeting the middle market in the region. Artinfo has a sales report from Art Basel Hong Kong. Artnet also takes a look at what sold. The Art Newspapers picks for the best shows during Art Basel in Hong Kong. Artnet’s guide to events and exhibitions in HK. Some of the people you will see or meet at the fair. Artinfo previews PAD Paris 2017. The Financial Times profiles Yan Lugen. The Art Newspaper interviews Qiao Zhibing about collecting. Alan Lau also participates. Larry’s List profiles Christian Utz about his museum for Urban Art in Germany. The Art Newspaper interviews Theaster Gates. Dana Schutz and David Salle in conversation about painting and art. Financial Times writes about Damien Hirst’s latest project. Lynn Barber meets Phyllida Barlow. Preview of Burden, a documentary on Chris Burden. Taylor Dafoe reviews Monica Bonvicini’s show at Mitchell-Innes & Nash. Christie’s pays a studio visit to Hiroshi Sugimoto. What Joe Goode has been up to. Christopher Knight reviews Steven Hull’s show at Meliksetian Briggs. NY Times profiles Sterling Ruby. Tanja Hollander personally meets and photographs all her Facebook friends. Dineo Seshee Bopape is the recipient of the fourth edition of the Future Generation Art Prize. Christie’s shares 10 things to know about Albrecht Dürer. Artnet looks at 18 Public Art Shows to Get Excited About in NYC This Spring. Triangle Books releases Calvin Marcus limited edition silkscreen print. Patti Smith buys a reconstruction of the childhood home of French poet Arthur Rimbaud. Brad Pitt spending his time making sculptor in Thomas Houseago’s studio. Categories: Art, Contemporary Art, Low Brow & Pop Surrealism, Overtime, Street & Urban Art. Tags: Contemporary Art, Dana Schutz, Features, Low Brow & Pop Surrealism, Overtime, Street & Urban Art, Whitney Biennial, Whitney Museum.